Carabao’s milk can be processed into nutritious food products like kesong puti and pastillas de leche. These simple processing techniques can be employed by small carabao owners to start a small business of their own. 1. Boil the mixture in a wide-mouth open kettle or frying pan under low heat until about one-third of the water has evaporated. The mixture will then thicken to a consistency similar to sweetened condensed milk. 2. Store the product in sterilized screw-capped bottles like used coffee bottles or plastic containers. 1. The mixture is cooked further until it becomes brown. 2. Then, let it cool and mold it into long bars like “tira-tira,” a locally-sold hard caramelized candy. 1. The principle behind cheese or curd making is to reduce the milk’s moisture content and then add salt. 2. Heat one liter of milk to 40oC. If a thermometer is not available, this temperature can be determined by dipping the back of the hand on the surface of the milk. If the heat can still be tolerated for a few minutes, the temperature is just right. 3. Remove the container from the stove, then add 20 ml. of crude rennet extract, prepared by soaking a piece of dried abomasum (one of the four stomachs of cattle, available in slaughterhouses) in warm water and a spoonful of vinegar. 4. In about 30 minutes, the milk will settle and form lumps called curd. 5. 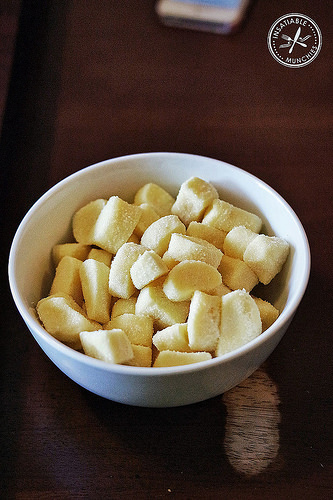 Cut the curd into cubes the size of corn kernels, then put these in a container and heat for 30 minutes until they melt. 6. Stir them gently. Add one tablespoon of salt. Mix thoroughly, cool, leave the container for about five minutes and drain off excess water. 7. Add one teaspoon of sodium citrate (available in drugstores) to serve as preservative. After thorough mixing, you can then put the cheese-like product in air-tight plastic bags. The curd can be stored for over a week. This curd is cheese.